Malta is situated in the middle of the Mediterranean Sea, halfway between Gibraltar and Alexandria, and Sicily and North Africa. Thus it has always been at the cross-roads of the trading and warring routes of this land-locked sea. Malta is chiefly composed of limestone with no hills higher than 300 metres and no rivers. On the South-West side it is guarded by high cliffs whilst on the North-East side the shore is indented with sheltered harbours. These proved to be very attractive to the sailors and navigators that sailed the Mediterranean. The origin of Maltese history goes back to some 4500 years BC, when some people from the neighbouring island of Sicily, who could see the island lying on the horizon, decided to cross the narrow waters to investigate. This obviously could not have happened unless these people had skills in sailing or rowing some form of craft which was large enough to carry with them their belongings, which included such animals as sheep, goats and cattle, as well as seeds like wheat and barley. These people settled on the island and sheltered in the many caves which exist there. The earliest inhabited cave is called 'Ghar-Dalam', the cave of darkness, where remains of these people and their artefacts give us an insight into their way of life. They cultivated the land, growing wheat and barley and practised animal husbandry. Around 3500 BC they started to build large buildings the like of which were not to be found anywhere else. They kept in touch with their cousins in Sicily obtaining from them obsidian and flint with which they could make tools to help them work the stones. These buildings, of which there are fifteen , are spread across the island. 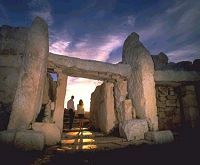 They are the oldest existing megalithic structures known to man - places like Hagar Qim, Mnajdra, Tarxien, etc. antedate the pyramids and Stonehenge by some 1000 years. This Neolithic peril about 1800 years, when, for no explicable reason, it ended abruptly. Nobody knows what happened, but famine, over population and disease could have been possible causes. Around 1200 BC Phoenicia started to expand her empire. The Phoenicians were traders and great mariners who sailed their ships along the shores of the Mediterranean. They sailed to England where they traded tin. It is said that they circumnavigated the continent of Africa. They settled on the North coast of Africa and established a city called Carthage. They also settled on the West coast of Sicily and in Malta. Indeed, the name 'Malta' is said to be derived from the Phoenician word 'Maleth', meaning refuge. Their stay in Malta was to last for 320 years. Conceivably the roots of the Maltese language derive from this Phoenician period. The Phoenicians also introduced glass making and weaving and built temples were they could worship their gods. Meanwhile, the city of Carthage grew in size and strength and eventually carved out an empire which covered the North African coast to the west of Carthage, and included Spain, Sardinia, Western Sicily and Malta. The Carthaginians got into difficulties with the Greeks in Eastern Sicily and with the arrival of Rome on the political scene during the 3rd century BC it was inevitable that the two nations would wage war for mastery of the area. Three wars, known as the Punic Wars, were fought from 264 to 146 BC ending with the fall of Carthage, and with Rome becoming supreme in the Central and Western Mediterranean. Malta became part of the Roman Empire during the 2nd Punic War (c. 218 BC) and remained part of the empire till the Vandals raided the islands in AD 395. One event of great importance to the Maltese took place in AD 5 8, when St. Paul, who was on his way to Rome as a prisoner, was shipwrecked on the Island. He stayed for three months during which time he introduced Christianity to the people. The Maltese take great pride in saying that they were one of the first nations to accept Christianity as their faith - but that is another story. We now enter a dark period in Maltese history, the period from AD 395 to 535. No records exist as to what happened during that time. Rome fell the Vandals in AD 455 and it is quite likely that towards the end of the 4th century, Malta too became part of the Ostrogothic Kingdom centred in Rome In AD 535, Malta was conquered by General Belissarius the Byzantine to form part of the Eastern Roman or Byzantine Empire, till the arrival of the Arabs. Islam started with the Hegira, when Mohammed fled from Mecca to Medina in AD 622. Before long his followers spread across North Africa into Spain and across the Pyrenees. Their expansion into Europe was stopped by the French King Charles Martel at Tours in AD 732, just one hundred years after the death of Mohammed. They invaded and captured Palermo in AD 832 and in 870 they invaded Malta. Once again Malta came in contact with a new and vigorous Semitic people. Unfortunately, very little documentation relating to the two centuries of Arab rule in Malta survives today. Indeed, Arab influence in Malta lasted much longer, since the Normans, who invaded in 1090 and took over the island from the Arabs, were indeed enlightened people and they tolerated the presence of the Arabs in the island. In fact, Count Roger never garrisoned the islands. Arab influence remained more or less unrestricted till about 1224, when the Muslims were finally expelled. The chief legacy of the Arab occupation in Malta must be the Maltese language itself, which has many elements of Arabic. Legends about the coming of Count Roger and the Normans to Malta are numerous, but most probably unfounded. 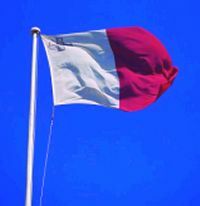 Count Roger is said to have given Malta her flag based on the Hauteville colours. He is reputed to have re-Christianised the Maltese, established churches, re-appointed a bishop and even expelled the Arabs. All of this is doubtful. However, the Normans' presence opened the door for the re-Europeanisation of the Maltese people. The so-called Norman Period lasted till 1194 and though the Normans left many treasures and architecture in Sicily, hardly any relics of this period exist in Malta. Following the death of King Roger II in 1154, a series of political struggles ensued. William the Good died childless in 1189 and a dispute arose over his successor. The rightful heir was the daughter of Roger 1, Constance, who was married to Henry VI, son of the German Emperor, Frederick Barbarossa. However, the Pope had other ideas. Fearing the penetration of the Germans in Sicily and Southern Italy, the church threw its support with Tancred. He was crowned king in 1190. However, he did not last long because Henry VI, through a series of intrigues within Tancred's court, acquired Sicily in 1194. Thus Malta became part of the German Kingdom under Frederick II - the Hohenstaufen rule. The Arabs were finally expelled from Sicily and Malta after an uprising in 1224. Following the death of Frederick II in 1250, the Hohenstaufen dynasty declined very rapidly. Many of Frederick's enemies, including the church, were keen to rid Sicily and Southern Italy of the Germans. Sixteen years of plots and counterplots eventually brought a new master to Malta. In 1266, Pope Clement finally achieved his objective and proclaimed Charles of Anjou as King of Sicily. Although the period of Angevin rule over Malta was short-lived (1266-1283), it is from this point onward that Malta shifted into the European scheme of government and administration. Because of high taxation, moves were made in Sicily to restore the island to Aragon, the rightful heirs to the crown of Sicily. Things came to a head in 1282 with the Sicilian uprising against the French, known as the Sicilian Vespers, which led to a bloody massacre of the French. The Aragonese took immediate advantage and installed Peter of Aragon as ruler of Sicily and Malta. The Aragonese period in Malta was to last for 130 years. During that time the Maltese people suffered the indignity of having their island handed from one noble to another as a fief for various services rendered to the king. These individuals increased taxation which led to local unrest amongst the people. Malta remained at the mercy of these powerful Sicilian magnates, like the Alagonas and the Moncadas. 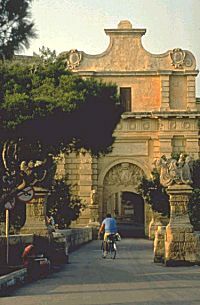 It was not till 1397 that the local council for Malta and Gozo, the Universita, made a strong petition to the crown for the islands to be restored to direct rule by the King. In 1412, Ferdinand de Antequera was elected King of Aragon, Castille and Sicily, the first Castillian to ever occupy the throne. In 1421, King Alfonso granted the Maltese islands and all the revenue from them to Don Antonio Cardona in exchange for a loan of 30,000 gold florins. He then transferred his right over Malta and Gozo to Don Gonsalvo Monroy. The Maltese disagreed with this arrangement. After five years they finally rebelled. In 1426 they pillaged Monroy's house in Mdina and laid siege to his castle at Birgu. The Maltese bought back the island for 30,000 florins. They also insisted on radical reforms including one that said that the islands wore never to be ceded again by the crown. Alfonso agreed to these reforms and finally ratified them in a Royal Charter in 1428. In 1479, Ferdinand II married Isabella of Castille. Their daughter Joanna married Philip Archduke of Austria. In 1518, the Habsburg dynasty was consolidated when their son Charles V, became the Holy Roman Emperor. Through the intercession of Pope Clement VIII, he granted Malta, Gozo and Tripoli to the homeless Order of St. John in 1530. 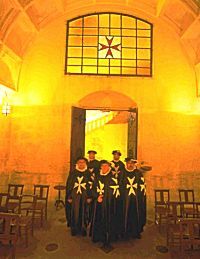 The Order of St. John came to Malta after the loss of Rhodes in 1522. They had been in Rhodes since 1309. Before that they were in the Holy Land where the Order was established in 1099 by Blessed Gerard to look after the pilgrims and the crusaders. The main enemy now was Turkey. The Ottomans were the dread of the Christian powers bordering the Mediterranean and the Balkans. Malta was becoming of supreme strategic importance for the control of the Mediterranean against the alarming growth of Muslim power. In 1547 the Turks made an unexpected attack on Malta and Gozo, taking many prisoners. The attack that followed in 1551 was more serious, for they ransacked Gozo and made off with 5000 prisoners. The Order was convinced that they must prepare the defences of the island for a bigger invasion. Soon afterwards, in 1565, a great Turkish armada appeared off the coast of Malta, starting what is now called The Great Siege of Malta, which was to last for four long months. When it was finally raised on the 7th September of the same year, many knights and Maltese had lost their lives, as did many Turks. 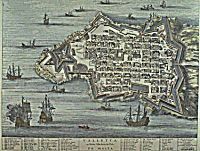 After the siege a new city was built, called Valletta in honour of the Grand Master who led the Order through the siege. This was to be a modem, fortified city, and eventually a city of culture and commerce. The city grew and so did the wealth of the Order. The threat of Turkish invasion was ever present. In 1572 the Turkish fleet was defeated by the Christian powers, including the Order, led by Don Juan of Austria at the battle of Lepanto. 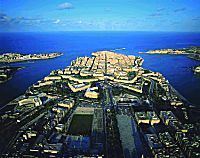 In the years that followed, Valletta became an impregnable fortress, housing imposing palaces and churches. It also became a flourishing centre for trade and learning. Successive Grandmasters initiated grand projects, such as the building of many fortifications, aqueducts and a university, where the teaching of anatomy and surgery took place. As time went by, however, the Order began to decline. The haughtiness and despotism of some of the Grandmasters upset the Maltese, leading to the famous Rebellion of the Priests, led by Mannarino in 1775 during the magistery of Ximenes de Texada. After the death of Grandmaster de Rohan (1797) the Order elected Ferdinand von Hompesch as its leader. The situation in Europe at the time was explosive. The French revolution had changed the face of Europe and through the influence of Napoleon Bonaparte, 'The Directory' gave him permission to invade Egypt and take Malta in the process. In 1798 he invaded Malta and expelled the Order. Thus ended 268 years of rule by the Order of St. John. French rule in Malta lasted only two years. The Maltese rebelled within three months of their arrival, besieging them in Valletta, from where, with the help of the British, they were finally ousted in 1800. The British occupied the island and for the next fifteen years the fate of Malta was undecided. The Maltese did not want the knights back and Britain was quite undecided as to whether it wanted to stay in Malta, but equally Britain did not want either the French or the Russians, who had their eyes on Malta for quite a while, to occupy the islands. The Maltese finally made up their mind and asked the British to stay. In the treaty of Paris, the occupation of Malta by the British was finally recognised. This was legalised in 1815 at the Congress of Vienna. The Maltese got used to British rule but it was not long before the Maltese appealed to the British for equal participation in the running of their island. Mitrovich and Sceberras made extraordinary efforts for this cause, as a result of which a Council of Government was set up in 1835, a small beginning along the road to representative government. Despite slow progress in the field of constitutional reform, Malta moved ahead, particularly in defence and imperial strategy. Malta benefited from increased defence spending by Britain. The dockyards were enlarged with five new dry docks being completed by 187 1. Malta prospered. The Crimean War (1854-56) again brought considerable military activity to the island and Malta's importance as a supply station and as a naval base was unquestionable. When steam replaced sails, and after the opening of the Suez canal, Malta thrived. She was now on the highway between Europe and the East. With every ship calling, the grand harbour became a beehive of activity from which everybody benefited. As usual the island's prosperity was quickly reflected in a dramatic rise in the population. This would continue well into the 20th century. From 114,000 in 1842, the population rose to 124,000 by 1851. Twenty years later it would reach 140,000 and it would more than double by the advent of World War II. With each increase, the problem of congestion, especially in the urban areas of Valletta and the Three Cities, would become serious. Attempts were made to encourage the people to move to the newer suburbs and the older towns and villages. Despite the prosperity, employment for the ever increasing work force would not always be available. Emigration schemes were introduced which initially were not successful. However, towards the end of the century, with the trade boom on the decline and Malta's fortune ebbing, the Maltese started to emigrate, mainly to North Africa. The political situation in Malta before World War I was increasingly overshadowed by the economic gloom that engulfed the island. The position deteriorated over a long time due to competition from other well-equipped ports in the Mediterranean. Government revenue from the slower activities in Malta's ports was falling steeply. It became clear that Malta's dependence on Britain's military spending was a severe handicap. Whenever there was a cut in defence spending, the people suffered. The winds of change in Europe and the gathering clouds of war also weighed heavily over Malta, and when World War I broke out, the people rallied to the allied cause. The naval dockyards again came into their own - but at the close of the war Malta had to once more face reality. There were to be severe cutbacks in defence spending. Much hardship and distress followed. Men were discharged from the army and naval establishments, unemployment soared and inflation ate its way into the miserable pay packets. There were strikes and protests. On the 7th June 1919 a huge and angry crowd gathered in Valletta for one of the meetings of the assembly. The pent-up frustration of the people suddenly exploded into a riot. The mob got out of control and caused much damage. Troops were called in and they opened fire. Five men were killed. In 1921 Malta achieved responsible government. Under a new constitution she was to have a legislative assembly composed of 32 elected members and an upper house of 16 members. All internal domestic affairs were to be in the hands of the Maltese with Britain retaining responsibility for foreign affairs and defence. Germany started the Second World War in September 1939. Malta was soon in the thick of it, once again coveted for its great strategic position in the Mediterranean. She was bombed very heavily by the Italian and German air forces and after two and a half years of never-ending air raids, the bravery, heroism and sacrifice of its people were recognised when King George VI awarded the Maltese people the George Cross Medal. After the war Britain started the process of decolonisation. Malta too was part of that process, but her path to independence was slow and often uncertain. Self-government was restored in 1947, but the decision of the British Government to dismiss workers from the dockyards caused massive unemployment. Consequently, there began a great exodus of Malta's people to the United States, Canada and Australia, where work was available. By 1964 a call for independence was made by the major political parties and after discussions with the British Government, an independence agreement, tied to a ten year defence and financial accord with the United Kingdom was finally approved. On 21 September 1964, Malta became a sovereign and independent nation within the Commonwealth. Ten years later, Parliament enacted important changes to the constitution and on the 13th December 1974, Malta was declared a Republic within the Commonwealth and appointed Sir Anthony Mamo as the first Maltese President of the Republic of Malta. Five years later, the last of the British troops on the island left Malta and on 31 March 1979 the Union Jack was finally lowered. Malta had at last reached the goal for which its people had striven for many centuries - the ability to make decisions on their own for their own good and the good of their own people, without any interference from outside powers. Malta is represented at the United Nations, takes an active part in European affairs and has finally taken its rightful place amongst the nations of the world.